Have you ever felt that you may not be studying enough for the NPTE? Or ever feel guilty when you are not constantly studying? 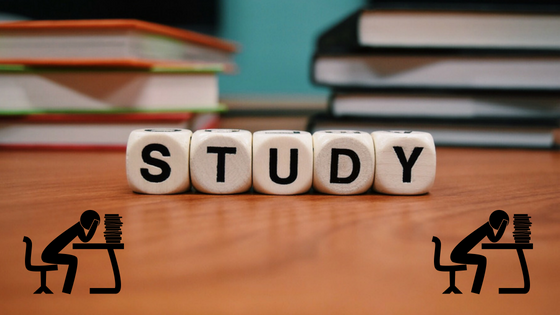 I recently received an email from a current candidate feeling anxious that the amount of studying time feels like he is not doing enough and he has the urge to do more studying in order to feel like he is actually accomplishing something. This is a common fear that if you are not constantly in the books or putting in enough time, then you aren’t learning or preparing for the NPTE. This is what I would call “I Gotta Study More” Syndrome. It’s a false sense of security that you learn more by putting in extra hours or cramming additional topics on any given day. Actually, I would say this attitude of “I gotta study more” can lead to burnout and frustration when finding that the information is not being retained as well. There’s a point in time where enough is enough and when going further only hurts you rather than helps you. Let’s relate this clinically with exercises. To help increase strength in general, you may perform 3 sets of 10 repetitions at 50 pounds. After a brief moment of rest, you decide that the previous time wasn’t enough and decided to do another 5 sets of 15 repetitions at 75 pounds. Now, your body make begin to shake a little and the reps may be wobbly; however, after resting slightly longer, you decide that you gotta do more exercises. For this next exercise you feel that 7 sets of 20 repetitions at 100 pounds will do, BUT now you are feeling mentally and physically fatigued and drop the weights on the second set at the 5th repetition. What happens next results in more harm or damage than actual gain. When your body is pushed beyond its limit, the after-effects of pain, delayed onset muscle soreness, the inability to perform optimally the next day causes more of a setback than the forward progress you may have hoped for. This can also happen when studying for the NPTE. Let’s relate this clinically at the doctor’s office with you as the patient. The doctor comes rushing in while looking at their watch, asks what’s going on, types up some notes while avoiding looking at you, prints out a script, then gets up and leaves to tend to the next patient. This is what I would call the hurry up and let me get through as fast as possible or cram in as many patients as possible. At the end of the day, the doctor may feel exhausted, but the quality of care would not be as great. Now, let’s take the same scenario with a different approach. The doctor apologizes for making you wait (delay of 15 minutes), sits down, looks and talks with you, asks how they can help, takes the time to assess, discusses possible plans of treatment, asks if you have questions, after feeling they have answered everything, the doctor gets up and mentions that they hope you feel better soon and leaves. Later that day, they may have followed up with you. This appointment time would have taken much longer, however, quality of care would be better. I would recommend more of this approach towards studying for the exam. You can learn and retain a lot more by focusing on a few topics for that day and allow for review time in the end. Let’s say you still want to push harder at times to get more done. While it may seem like you are studying longer, you may find that your brain is actually fighting back by shutting down, making it harder to comprehend any further information. You may find yourself glossing over things not knowing what you just read or studied. Then you’ll get frustrated having to redo what you just spent some time on. When you reach this point, it’s best to take a break to allow your brain to be clear. It’s like being switched “on” all the time. Eventually, the light bulb will dim, flicker and then go out. Save time and energy by taking a break and switching to the “off” state every day. You’ll feel better and find that you will comprehend and retain more that way. The feeling of having to do more tends to have a negative impact psychologically, as well as in other holistic areas such as socially and emotionally. The “I can’t let go” keeps the brain on and activates more of the “fight or flight” feeling. This can create what I would say is the “Examzilla” attitude, where stress takes over and makes a person crabby or unpleasant to be around. The mindset can be negative and essentially makes it harder to retain information that is learned when studying for the NPTE, especially after long periods of time. The overwhelming urge of needing to do more can create unnecessary stress and anxiety, making it even harder to learn and retain information for the exam. Although we are taught to know everything for the exam, there will ALWAYS be something to learn. The goal isn’t that you need to know everything, it’s about being able to answer entry-level competence questions in a safe and competent manner. An academic study mistake that I see from candidates is the feeling of having to read “everything” about a particular topic. This is where the “I gotta know everything” mindset is false. No, you actually don’t need to know everything for the NPTE. There’s a limit to how much is needed to be able to answer the multiple choice questions. While it’s true you want to know information, you’ll want to avoid the mistake of referring to too many resources. Understand that after a while your brain needs a break. Here are some tips to practice on reducing the so-called “not studying enough” attitude. When all is done for the day, tell yourself “Great! I accomplished what I wanted.” Now, go do something fun and allow your brain to relax.